This is a love letter to Brixton Village from established local food blogger, Miss South. We’ve linked before to some of her excellent recipes and this new book promises much more of the same. It also well produced and will be a practical asset in the kitchen, unlike too many of today’s cookbooks that are aimed more at the coffee table. The format is straightforward with sections for meat, fish and so on. 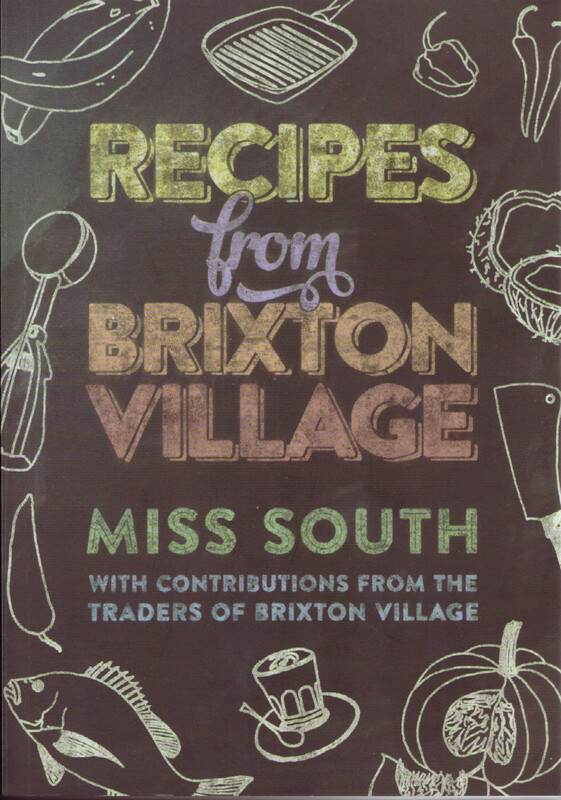 The unique feature, as indicated from the title, is that all the recipes come from or are inspired by the traders in Brixton Village. So it doesn’t cover Market Row or elsewhere in Brixton but it still provides plenty of material. We are looking forward to trying more of her recipes and top of the list are Jerk Chicken from Fish, Wings & Tings; Jollof Rice from MTK African Restaurant (yet to be reviewed here but coming soon); and Aubergine Ragout from Casa Sibilla. And I will have to make the Anzac biscuits from Federation Coffee – the main reason for going to Federation Coffee as their coffee is a bit hit and miss. Being Brixton based there’s a particularly strong section entitled ‘Seasonings’ which illustrates the cultural diversity in the Village. West Indian, Italian, Thai, Portugese, Columbian, Japanese, Ghanaian and even British (tomato chutney) – it’s all there. But this is not just recipes. There is a history of the covered market (with a contribution from Anne Fairbrother of Cornercopia), especially the transformation over the last four years, and a useful description of the Village’s food shops and eating places. We at eatinbrixton have welcomed the change in the market, which has more or less coincided with the three years that we have been writing about the meals we have enjoyed, as well as a few others we have found less satisfying. The change has not pleased everyone, with complaints mainly about ‘gentrification’ but also about the loss of the more traditional traders. On the issue of what you can buy, the fact is that the range of what’s available is vastly greater than it was in the market’s nadir and there’s little if anything of significance that’s been lost. And on gentrification, what we see is a thronged market packed with people enjoying themselves. This is a must buy for anyone who likes to eat in Brixton.